Authenticating Tibet, which has been quite successful in French and English as a guide to understanding the myriad elements that make up the Tibet Question, will soon be available to those who read Chinese in an edition published this spring by Avant-garde Publishers in Taipei under the title 遮蔽的圖伯特：國際藏學家解讀西藏百題問答. It should be available in bookstores and for purchase online shortly. My deep thanks to 謝惟敏 for her impeccable translation of this introduction. The entire vocabulary of nationalities and nationality terms in the PRC is imbued with a conscious political element of control by definition. The very designation “minority nationality" reduces all of the peoples so designated to the same uniform level, regardless of whether they number in the millions and have a conscious history of themselves as a political power with their own government and a bureaucracy literate in their own language, or whether they number in the tens of thousands with no national history. 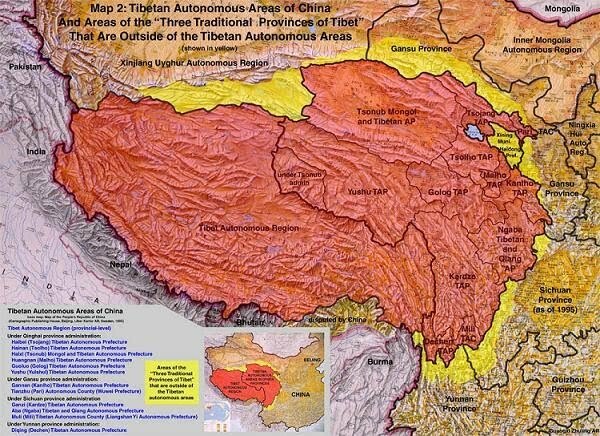 This article was originally published at http://lovetibet.ti-da.net/e3505684.html. Elliot Sperling is an Associate Professor of Central Eurasian Studies at Indiana University. While there is a modern precedent for using the variant “Tubo,” the fact that Tubote is already found in the Qing (often with the variant forms土伯忒 or 土白特, etc.) and that it more clearly reflects the name by which Tibet is known in almost all the world’s languages recommends it as the form to be used throughout this book. In addition, the present-day Tubo圖伯 is vulnerable to being confused with the erroneous Pinyin rendering of Tufan吐蕃 as “Tubo,” a problem discussed below. Don-grub rgyal and Khrin Chin-dbyin, Thang-yig gsar-rnying-las byung-ba’i Bod chen-po’i srid-lugs = Duanzhi jia端智嘉 and Chen Qingying Qingying 陈庆英, Tufan zhuan吐蕃傳 (Xining, 1983).